This June, Toronto City Council approved the proposed Residential Apartment Commercial (RAC) zone. Following a process of nearly two years of research, public consultation, policy development, and advocacy in partnership with United Way, City of Toronto and Toronto Public Health, the RAC zoning will take effect by summer’s end, (barring appeal), in nearly 500 Apartment properties that form dozens of Apartment Neighbourhoods across the city. The new zoning by-law provides a new and flexible land-use framework for Apartment Neighbourhoods. The goal of this new framework is to enable healthy, complete, and vibrant neighbourhoods better able to respond to local needs and opportunities. The goal is addressed primarily by allowing for a full range of uses within these neighbourhoods: commercial activity, social activity, and community services – amenities that most areas of Toronto take for granted. Surprisingly, these uses within Apartment districts have until now been largely prohibited. This is because the zoning of Apartment areas was conceived in the 1950s when Toronto’s suburbs were thought to function very differently. These areas were planned with a strict separation of uses: Residential, commercial, and institutional uses were all meant to be a convenient drive from one another, but very separate. While this worked for the car-centric suburbs of fifty years ago, it has prohibited the appropriate evolution of these neighbourhoods in response to ever changing local needs, opportunities, and aspirations. So although the communities themselves have evolved, the physical neighbourhoods have largely remained fixed. Not only inconvenient, this condition has begun to affect health outcomes, because the strict zoning laws have dissuaded local services, fresh food, employment opportunities, childcare amenities, and so on, despite the needs on the ground. The new RAC zone is a big step in shifting this condition and providing the tools required to enable the hundreds of Apartment Neighbourhoods found throughout Toronto’s inner suburbs (and beyond) to emerge as integrated, vibrant, and diverse community hubs. Opportunities enabled by the RAC Zone, from Toronto and around the world. Yet the zone’s approval is just the start. 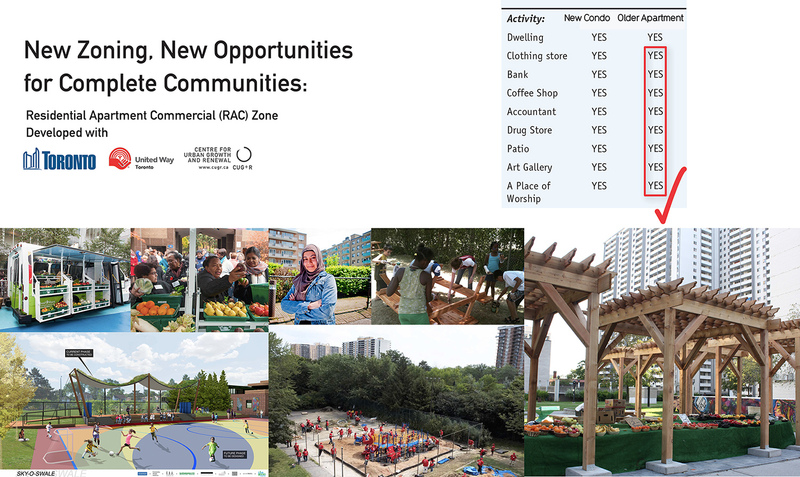 While the RAC zone removes significant barriers to community social enterprise and positive neighbourhood investment, the next step is for landlords, residents, and communities to bring this potential to life. Communities across the City, form Thorncliffe to Rexdale, are beginning to plan initiatives, and the City, local residents and a wide range of partners are working toward providing active support and additional policy tools to meet the promise of the RAC Zone. There is much work ahead. Once again congratulations to United Way Toronto, City of Toronto (Zoning team and Tower Renewal), and Toronto Public Health. A City-wide zoning change of this type is a first for Toronto, and would not have been possible without a diverse group of collaborators and stakeholders working together, often in new ways. It is a testament to what is possible through collaboration, and perhaps the start of new ways for social agencies, local communities, architects, and the City to work together towards a brighter Toronto. The following are maps of the 500 properties where the new RAC Zone has been approved as a first round of implementation. Additional sites, such as those downtown, will move forward in subsequent phases.